Photo courtesy Gilbert's Resort Key Largo. 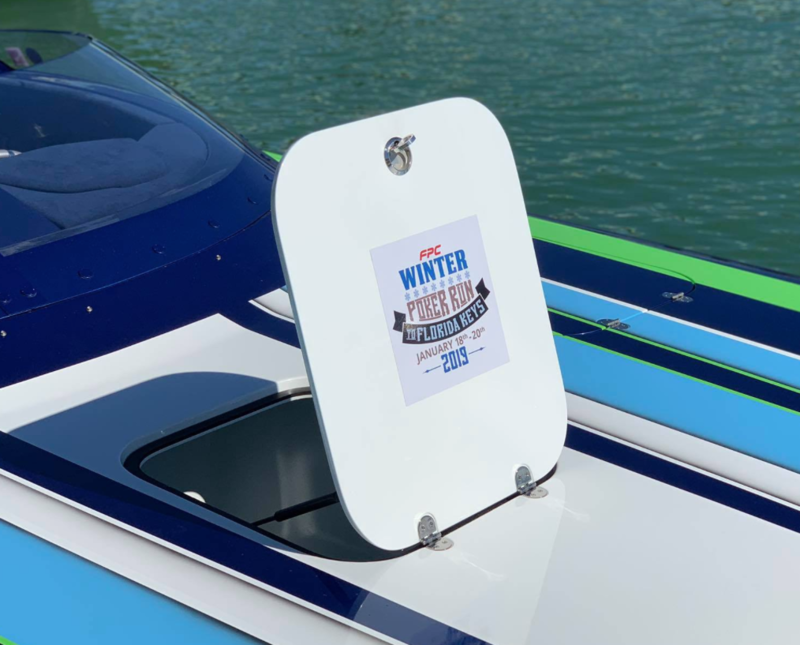 Led by Stu Jones, the Florida Powerboat Club (FPC) just wrapped up its 2019 Winter Poker Run. The group returned to a popular destination from the past: Hawks Cay Resort & Marina in Duck Key, near Marathon. 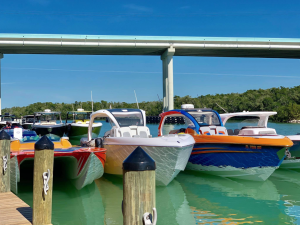 This resort had been closed for over a year, after sustaining heavy damage in September 2017’s Hurricane Irma, but recently re-opened its doors.The group of 22 boats assembled Friday morning at Haulover Marine Center in North Miami with a nice mix of cats, performance vees and nine center console models, including two Deep Impact, two Mystics, two Nor-Techs, a Concept 44 and a Blackwater—all featuring Mercury Verado power. Performance cats made a big showing, especially the twin outboard cats powered by Mercury Racing 400Rs. These were represented by a brand-new Mystic 38 cat, two Wright Performance 36s, and a 34 MTI. All of these boats soon became the front runners when the boats took to the open ocean from North Miami. Poker cards were handed out at Haulover Marine Center, Grove Harbour Marina and Gilbert’s Resort of Key Largo. The January weather was fantastic, with warm temperatures and light winds—more like spring weather to many of us—and delightful weather for the many northerners who had come down to Florida to escape the winter chill. New to the poker run fleet was Jones’ newly completed Project 1080 38 Cigarette, which was a partnership with Mercury Racing. It’s powered by a new set of Mercury Racing 540 stern drives. According to Jones, the boat ran extremely well, and received many compliments from the FPC members, many of whom have been following the project on social media. Everyone was delighted to see the boat finally performing its duties as an official paceboat for FPC. Friday night, the group all got together for a nice meal at the waterfront restaurant, Angler & Ale, located on the Hawks Cay Resort property. On Saturday, it was time get out an explore the local waters. 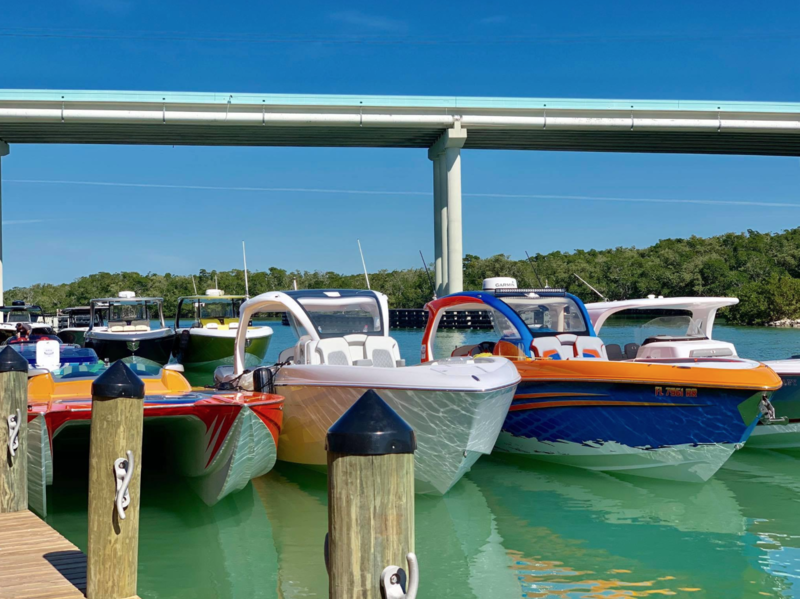 A helicopter joined in as the boats headed south from Duck Key towards Marathon, and the choppy seas slowed many of the boats down to a 35 mph pace, while others braved the rough chopped and powered through the seas to the Seven-Mile Bridge. With the chopper in hot pursuit, the fleet gathered up for the money shot, as each boat passed under the spans of the bridge. The group turned north on the more protected bay waters on the Gulf side, and settled in for lunch at an area hotspot: The Island Fish Company in Marathon. Later that day, teams stopped by the FPC hospitality suite for a happy hour and to play out their poker cards. Congratulations to Barry and Stephanie Henson of Tennessee, who pulled the best poker hand and won FPC prizes along with a customized AO Cooler—in spite of the fact that their Nor-Tech 43 Supercat had an engine failure a day earlier and had to be trailered back to Miami. Sunday saw a turn in the weather as a major cold front pushed through in the early-morning hours, bringing teaming rain and colder temperatures. Some teams did not heed weather forecasts, which predicted rain stoppage by noon, and instead left in the earlier morning hours, only to be showered on much of the way home. For others, including the FPC Project 1080 crew, an 11:30 departure proved to be well-planned, as the sun emerged and it was clear skies for the 100-mile trek home. 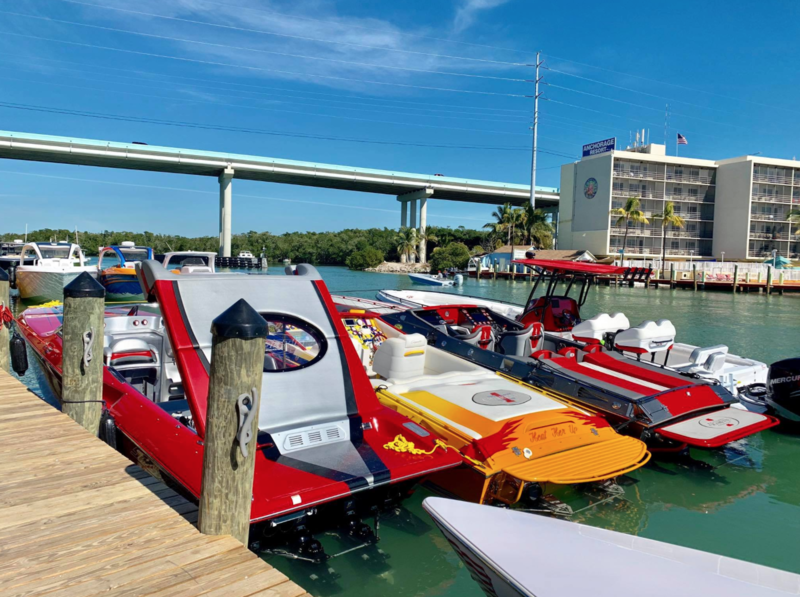 FPC looks forward to its next 2019 event, the Miami Boat Show Poker Run, Feb 21-24, 2019. They will be returning to the Florida Keys with Key Largo as its new destination. For more info, visit the FPC site or call the (954) 545-1414.